For some people in Longmeadow... having access to high speed Internet at home is an expensive non-essential "luxury". 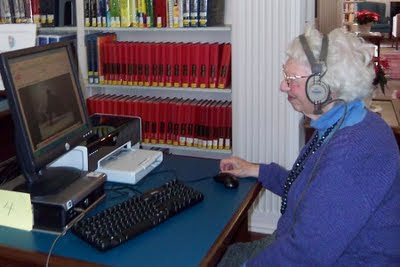 However, many of the new "social media" like YouTube, LinkedIn, Facebook and others being adopted as standard methods of communication require the use of a recent vintage computer as well as high speed Internet. In today's difficult economic environment, having access to high speed Internet is crucial to finding a new job. Storrs Library with its state of the art computer technology provides an important resource to many people in our town. As our town leaders work through this years' budget crisis and are confronted with difficult choices regarding cuts in services.... let them not forget that our town library is a critical resource that we cannot afford to lose. Perhaps, rather than closing our Storrs Library we might consider reducing or eliminating the library services at Longmeadow HS (+ middle schools and elementary schools) and centralize these services at Storrs Library so that all town residents can benefit. Access to library services for high school and other students would likely increase significantly since Storrs Library is open at night and on Saturdays. In addition, many of the resources for Storrs Library are accessible 24/7 via the Internet. If you haven't visited Storrs Library "on the web", please consider doing so. Here is a link - check it out for yourself and I think that you will be impressed! Just an idea... thinking outside the box! The Springfield Falcons Hockey Team is dedicating the Saturday, January 23 game to benefit the Western Massachusetts Regional Library System which supports all western Massachusetts libraries. Tickets (regularly $17) are only $10 for everyone who orders using the special form. This offer of discounted tickets to the January 23 game is extended to the general public. 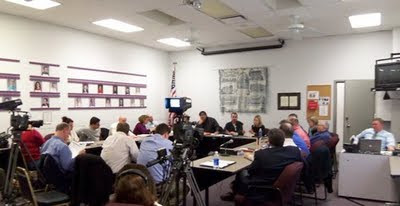 I attended the Tri-Board meeting last Monday night (11/30/09) and came away disappointed with the discussion that took place between our town leaders. It certainly wasn’t the meeting that I was expecting and left me feeling that this year’s approach to resolving difficult budget issues may not be much different from previous years. I believe that there are some major planning and budgeting hurdles to overcome this year. On the horizon there is a decision that will likely be made by town voters next June regarding the funding of new high school (Proposition 2½ “debt exclusion” override) and the possibility of a large budget operating deficit that will result in a significant reduction of town/ school services and/or the need for an Proposition 2½ “operational” override. At this latest Tri-Board meeting there was no clear budget strategy outlined as to how the town will successfully navigate these difficult times. Given that our last Proposition 2½ override in Fall 2007 passed by only 5 votes with a 40% voter turnout… I believe in today’s financial world that the probability of passing two Proposition 2½ overrides by Longmeadow voters in a single year is very low. There was much dialog about the gloomy state of town finances for the upcoming FY11 and FY12 budgets. Paul Pasterczyk, Longmeadow's Finance Director presented an overview of these budgets with projected deficits ~ $2.1 million in both FY11 and FY12. Level funding (not level services) for both schools and town departments. COLAs for teachers, fire and police were not included since collective bargaining is still ongoing. Note: A negotiated 1% COLA for each of the contract years (FY09, FY10 and FY11) will add an additional $900K of annual spending to the FY11 and FY12 budgets. Step increases were included for teachers at $450K in FY11 and $900K in FY12. There was no change in capital funding of projects for FY11 and FY12 vs. FY10 ($681K) which is significantly lower than FY09. As of November 30, the Operational Stabilization Fund (OSF) has $1.9 million (vs. $2.15 million as last reported in mid October). There is currently $0 in the Free Cash Fund. The Select Board will spend time discussing the upcoming budget process at their meeting tomorrow night (December 7). The official FY11 budget planning process begins next with instructions from the Town Manager going to Town departments on December 15. Let’s hope that town leaders start showing the necessary leadership to get us through these difficult times.